When it comes to Jennifer Armentrout, no matter how many times I decide to stay away, I can’t seem to help myself. She is the only one capable of making me pick up a New Adult novel, since it’s a genre I generally work hard to avoid. And what’s more, although I’m fully aware of the flaws in her books, rarely do I regret my decision to read them. 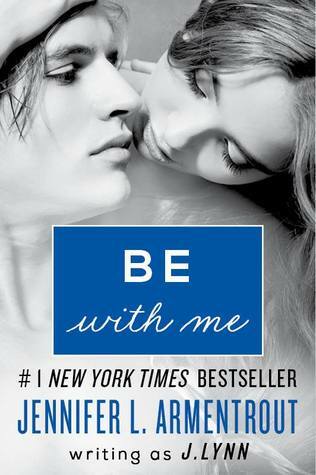 Be with Me is exactly what you’d expect – a New Adult romance filled with sexual tension and angst. We remember from Wait for You that Teresa was in a long and abusive relationship, but until now, we only saw the scars it left on Cam. In Be With Me, we see what that kind of relationship can do to a young girl like Teresa. That’s not to say that Teresa is anyone’s victim anymore. If anything, she’s stronger, braver, more resilient than ever. Her experience with Jeremy wounded her deeply, yes, but it also turned her into a better, more mature person. The same, however, cannot be said about Jase. He has his own fair share of past traumas and wounds, but he doesn’t handle them nearly as well. The thing I liked most about Cam in the previous book was that he pursued Avery relentlessly. He never once claimed to have changed his mind or tried to fight his attraction to her. Unfortunately, we weren’t as lucky with Jase. He had the whole ‘Ill kiss you, but then I’ll tell you what an awful idea it was’ routine down to a T, and let me tell you, it didn’t take long for it to start getting on my last nerve. Once again, Armentrout shows her greatest strengths in her very natural dialogues. her familiarity and willingness to use current slang breathes and extra breath of life into her characters, making them far more realistic and endearing. While she’s not the best of writers per se, writing witty dialogues that flow naturally is something she’s extremely good at. The secondary characters aren’t nearly as important in this installment, but we were, at least, given a chance to get to know Calla, Teresa’s friend and protagonist of the next book in the series, Stay with Me. While it’s true that I don’t normally read NA, when it comes to JLA, I’m obviously powerless to resist. Stay with Me should be released sometime in 2014 and I’d be lying if I said I wasn’t looking forward to it. I'm trying to remember if I ever read any of this author's books. The name sounds familiar. I'll have to go look now. I haven't started this series yet, and I'm sure I'll eventually read but not right now. I'm so glad you liked it overall, Maja. I liked this one better than the first one because I liked Tessa much better than Avery. I do agree with you about Jase. He was infuriating, but I still couldn't help but fall for him. I still haven't read one of her adult novels, I think because there are always so many mixed reviews on them. I really want to read one and fall in love with it but I just have this terrible feeling that won't happen. Shoot! I was so looking forward to this one because I liked the little pieces of them we got in Cam's novella, but I get so frustrated with the push/pull nonsense. Obviously Jase is a fan of it and that's a touch disappointing. Like you, what I loved about Cam was how when she pushed, he only took a small step back, he didn't retreat entirely. I'm still going to give this one a whirl, but I'm glad to have read your thoughts beforehand! Lovely review Maja. I have book one in my tbr pile and while I am disappointed that the secondary characters aren't as developed I look forward to reading this. I do love JLA and agree she never makes me regret reading her books. That is a great point about Cam being all relentless in his pursuit, where as Jace was hot and cold, and while I understand WHY, it is still infuriating. I know. I can't help myself, either. Her books are SO HIT-OR-MISS! *sigh* Throw in the fact that it's a typical NA (also hit-or-miss with me) and I've got a snowball's chance in Atlanta (KIDDING!! how 'bout a snowball's chance in South Carolina? At least I live there...) of it being a hit with me. I am curious about this one, I am liking Jase in the current book I am reading, but I am totally loving Cam so it's good to see at least that their pursuit is different. Huh? The character got on your last nerve and it was full of drama and angst but you still want more? You are a confusing woman. I am staying away. I have almost given up on the genre! it's nice to have an author like that. I remember a review for the first one and I know I really need to go back to her writings, I read one by her a long long time ago but not all her new release, I should try. I have such mixed feelings toward JLA. Like you, I try to stay away but invariably find myself picking up one of her books. Of course, having been bombarded with ARCs and discovering different romance authors, it's been awhile since I've read her work but I understand the sentiment perfectly, Maja. Lovely review! I totally agree that JLA is good at crafting natural dialogue. I enjoy her character interactions the most when it comes to her books, and definitely love the usual humour and banter. I was a little bit disappointed with this one (or perhaps just didn't appreciate Jase and Teresa as much as I did Cam and Avery), but I still had fun with it overall and know that I'll almost definitely check out the next one. These feel increasingly more like guilty pleasure reads than anything. Lovely review, Maja! I've not read any of her work yet. Sounds good. :) Thank you for sharing. I've said this before but J. Lynn is hit or miss for me. I haven't yet read any of her New Adult books, but I'm on the fence about whether I'd enjoy them. I'm glad you are liking these okay though. Whenever I pick up one of her books it's 50/50 if I'll enjoy it. I always have to get past the typos and then decide if the guy is too alpha to like or be like Cam where he's arrogant but amazing. I just might with this one though. I stay away from NA too but I feel like eventually I'll cave and read JLA's NA books just to see what all the fuss is about. Her dialogues make her books sooo easy to read!